In our connected age, there is an abundance of news and opinion, coming at us 24/7. The latest terror attack, the presidential debates or the shenanigans of celebrities. It’s all covered in minute detail, and we are free to share it and our opinions on the matter. But missing from that motley collection of trivia and substance is news of what is happening in our own backyards, save the personal videos posted by friends. Local news about a tax increase or a zoning decision is rarely of such interest that it trends, but it has an outsized impact on the everyday lives of residents in small towns, city neighborhoods and suburbia. When local newspapers fail, these communities are often left without any news organization to care about, watch over and report on the actions of the county commission or the local school board. To better determine the impact that the loss of a local newspaper has on a community, researchers at UNC’s School of Media and Journalism have spent the past two years collecting additional information on the more than 9,000 local papers in our proprietary database. This analysis found an unrelenting loss of newspapers and readers since 2004 with troubling implications for thousands of communities. While there are entrepreneurs who are beginning to fill the void that is left in a community when a newspaper fails, much more needs to be done. Vanishing Newspapers: The United States has lost almost 1,800 papers since 2004, including more than 60 dailies and 1,700 weeklies. Roughly half of the remaining 7,112 in the country – 1,283 dailies and 5,829 weeklies – are located in small and rural communities. The vast majority – around 5,500 – have a circulation of less than 15,000. Vanishing Readers: Print readers are disappearing even faster than print newspapers, and the pace appears to be accelerating. Over the past 15 years, total weekday circulation - which includes both dailies and weeklies – declined from 122 million to 73 million. While more and more readers prefer to receive news online, this dramatic loss has been driven not only by changes in reader preference, but also by the business decisions of newspaper owners. The decrease in daily circulation comes primarily from the pullback of metro and regional newspapers from distribution to outlying rural and suburban areas. In contrast, much of the loss in weekly circulation since 2004 comes from the closure of more than 1,700 weeklies. This decrease in print readers raises serious questions about the long-term financial sustainability of both small community and large metro newspapers. Who Lost The Most? : No state has been spared the death of a newspaper. California lost the most dailies of any state. Some of the most populated states – New York, Illinois and Texas — lost the most weeklies. The loss of newspapers in one state has the potential to affect residents in many other states, since government agencies often rely on local news reports to help identify and contain public health crises and assess the impact of environmental disasters. Living Without a Newspaper: There are hundreds — if not thousands — of communities at risk of becoming isolated news deserts. There are almost 200 of the 3,143 counties in the United States without any paper. An additional 1,449 counties, ranging in size from several hundred residents to more than a million, have only one newspaper, usually a weekly. More than 2,000 have no daily paper. The residents of America’s emerging news deserts are often its most vulnerable citizens. They are generally poorer, older and less educated than the average American. Silence in the Suburbs: Seventy percent – 1,300 – of the newspapers that closed or merged were in metro areas. All but 50 were weeklies, most with a circulation under 10,000. Their demise leaves a news vacuum for many of America’s suburbs and urban neighborhoods, where residents have historically relied on community weeklies to keep them informed about the most pressing hyperlocal issues. The Death of the Rural Hometown Newspaper: More than 500 newspapers have been closed or merged in rural communities since 2004. Most of these counties where newspapers closed have poverty rates significantly above the national average. Because of the isolated nature of these communities, there is little to fill the void when the paper closes. 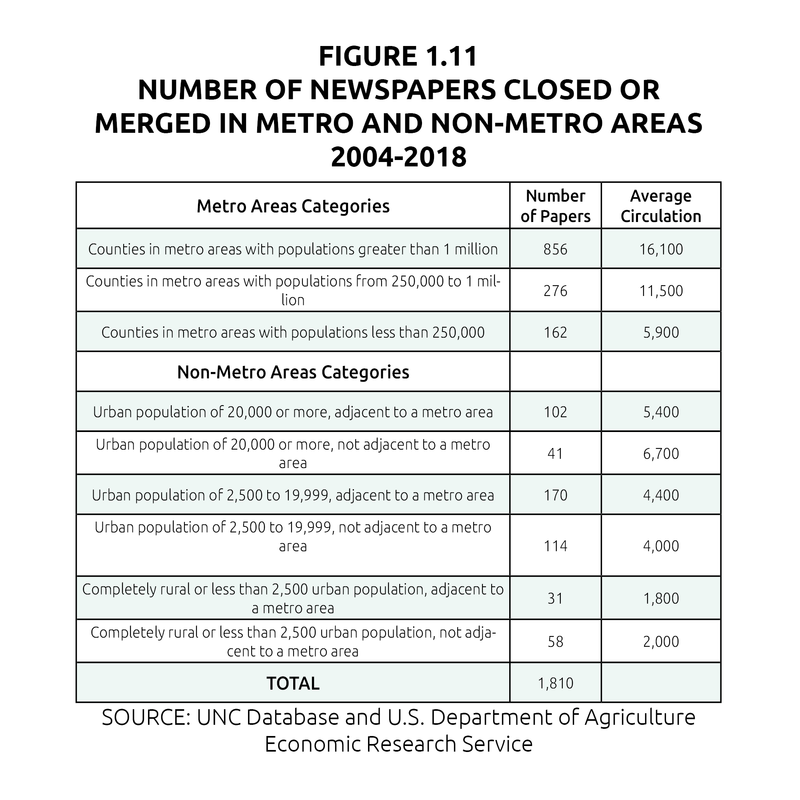 The Shrinking State and Regional Newspapers: The dramatic pullback in circulation and coverage of state and regional papers has dealt a double blow to residents of outlying rural counties, as well as close-in suburban areas. Many of these communities have also lost their weekly hometown paper and are left without any credible and comprehensive sources of either local or regional political and economic news. And Then There Was One: Fewer than a dozen cities of any size have two competing dailies. The lack of competition among newspapers in major metro markets often results in less coverage of local and state government, and residents of those cities pay the price. Studies have found that closure of a competing metro daily often leads to governmental inefficiency and higher costs for city residents. While closures of large dailies like The Tampa Tribune and the Rocky Mountain News in Denver grab headlines, in fact, 53 of the 62 dailies that closed or merged since 2004 had circulations of less than 50,000. Twenty of those shuttered dailies had a circulation of less than 5,000. This includes The Daily Times of Pryor Creek in rural northeastern Oklahoma. Getting the information out is even more difficult for the 1,749 communities that have lost weeklies over the past 15 years. Weeklies are often the only sources of very local news and information in communities – large and small, rich and poor, urban and rural. These shuttered weeklies ranged in size from the San Francisco Independent, with free distribution of almost 400,000, to the Sudan Beacon News in Texas, with a circulation of only 300. Of these closed or merged weeklies, only 45 had a circulation above 50,000. More than 1,000 had a circulation of less than 5,000. While there are more than 7,100 newspapers in still publishing as either weeklies or dailies, this count most likely overstates the number of stand-alone papers in existence today. Based on our analysis of the papers owned by the largest chains in the country, we estimate that between 10 and 20 percent of the papers in our database are geographically zoned weekly editions published by larger metro dailies. For example, the UNC database lists 158 papers owned by Digital First Media, the third-largest chain in the country. However, the website for Digital First lists fewer than 100 papers. Zoned editions are difficult to identify because they are listed separately as stand-alone weekly papers in various industry databases such as those compiled by Editor and Publisher and BIA Kelsey. For our 2018 report, we have supplemented the information in industry databases with data obtained from all 50 state press associations and our own extensive independent online research and interviews with staff at individual papers. As a result, we identified 300 papers that were published in 2004, but were not included in national industry databases. Therefore, our 2004 number has been adjusted upward from our 2016 report to almost 8,900 papers. Simultaneously, we removed from our 2018 number the 600 papers that we identified as evolving from stand-alone newspapers into shoppers or lifestyle and business specialty publications, with little or no public service journalism. However, we left the zoned editions in the total of number of 7,112 papers since, even though they are not stand-alone newspapers, they are still – for the time being – providing a diet of local news that informs their respective communities. Recent history suggests that as the economics of print publishing continue to decline, many zoned editions will either become shoppers and specialty publications, or be eliminated entirely. Print readers are disappearing at an even faster rate than print newspapers, and the pace appears to be accelerating. 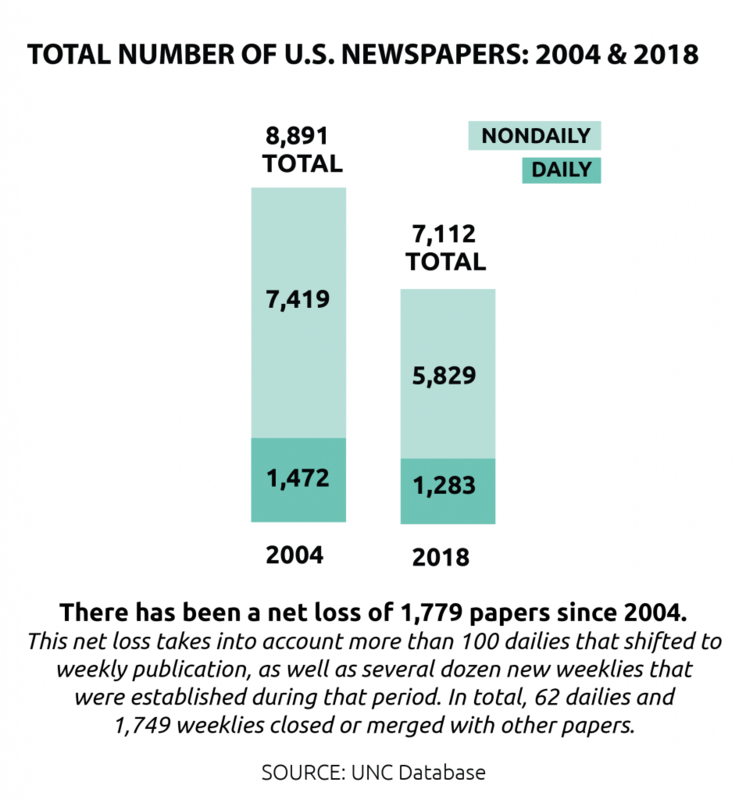 Over the past 15 years, total weekday circulation — which includes both dailies and weeklies – declined 40 percent, from 122 million to 73 million, for a loss of 49 million. In the last four years alone, newspapers shed 20 million in circulation, an indication that the pace of the downward slide may be increasing. This decrease in print readers speaks to the declining influence of newspapers, which once set the agenda for debate of important issues in their communities and helped encourage local economic growth and development. It also raises serious questions about the long-term financial sustainability of community newspapers, most of which still rely on print advertising and subscriptions for between 60 and 80 percent of their total revenue, and don’t have the financial reserves that the large national and regional papers do. 6 As circulation declines and news coverage of outlying regions is cut back, print newspapers lose reach and relevance for both local advertisers and readers. This, in turn, drives down profitability and forces publishers to cut costs, instead of investing in ventures that will transform their print business models for the digital age. In contrast, the decline in weekly readership resulted primarily from the shuttering of 1,700 papers. The average circulation of the country’s surviving 5,829 weeklies is 8,000, roughly the same as it was in 2004. However, print readership for both dallies and weeklies is probably much less than what is reported in industry databases. The Alliance for Audited Media (AAM) is the most authoritative source for circulation, but only 13 percent of papers in the UNC database – typically the largest papers – subscribe to AAM audits. More and more smaller newspapers — dailies as well as weeklies — are turning to self-reporting or not reporting their circulation numbers to sources such as Editor and Publisher. Additionally, the reported AAM numbers for the large dailies often lag behind the audit by a couple of years. Circulation statistics in the UNC database represent primarily print distribution, an admittedly imperfect measure since it does not count the increasing number of people who access local news online. However, readership data for most digital editions of the newspapers in this report are not widely available or comparable. Also, according to the Federal Communications Commission, 9 between 40 and 60 percent of residents in rural areas lack reliable access to either broadband or wireless, therefore limiting their media options when a local print newspaper folds.Therefore, print circulation becomes a proxy – albeit imperfect – for the dramatic decline in influence and relevance of local papers in recent years. Since 2004, one-fifth of all U.S. newspapers have been closed or merged. The more rural state of Kansas lost seven dailies, all with circulations under 10,000. The communities affected spanned the entire state, from the affluent Kansas City suburb of Overland Park to farmlands in Liberal, Kansas, in the southwest. Some of the most populated states lost the most weeklies. Illinois lost 157, New York lost 155 and Texas lost 146. The weeklies in Illinois and New York were predominantly in the suburbs surrounding the large metro areas. This includes a chain of 35 independent weeklies in Suffolk County on Long Island, which were shuttered in 2008. In contrast, in Texas, nearly half of the weeklies closed were in rural counties. The loss hit some states disproportionately, depending on how many papers they had. In 2004, the number of papers ranged from 14 in Hawaii to 638 in Texas. While Texas lost 146 papers, it still has almost 500 in 2018. The island state of Hawaii, on the other hand, lost five of its 14 papers, including three weeklies and one daily on its most populated island of Oahu. In 2010, the two major dailies in Honolulu, the Honolulu Star-Bulletin and Honolulu Advertiser, merged to become the Star Advertiser, 11 robbing America of one of its last two-daily-newspaper towns. The loss of newspapers in one state has the potential to affect residents in many other states, since government agencies often rely on local news reports to help identify and contain public health crises and assess the impact of natural and man-made disasters. Officials at the Centers for Disease Control and Prevention (CDC), for example, say that the death of newspapers throughout the country is already hindering their ability to spot and track the spread of disease, which could lead to outbreaks of more epidemics. 12 The CDC relies on the news stories in local papers to provide them with an early warning system,which is critical in containing the spread. So far, social media has been much less reliable. As newspapers vanish and readers drop off, an increasing number of Americans are living without a reliable and comprehensive source of local news. Previously, we defined a “news desert” as a community without a local newspaper. As a result of the dramatic shrinkage in the number of local news outlets in recent years, as well as the decrease in local news coverage by surviving newspapers , we have expanded our designation of news deserts to include communities where residents are facing significantly diminished access to the sort of important news and information that feeds grassroots democracy. 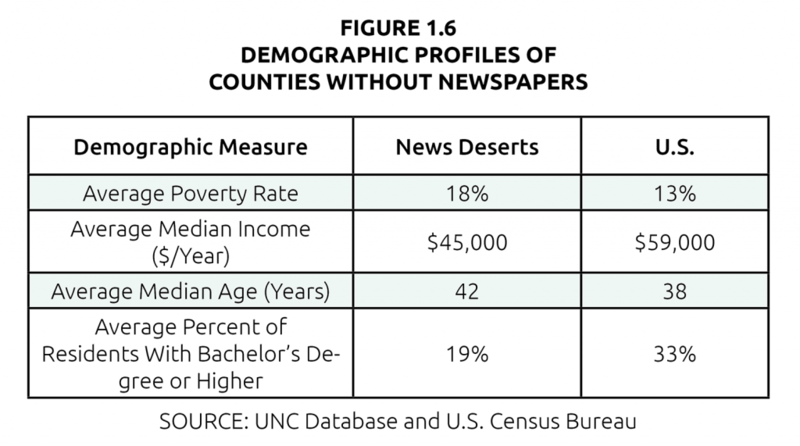 There are hundreds — if not thousands – of communities at risk of becoming isolated news deserts. The numbers have grown dramatically in recent years as local newspapers vanish and nothing replaces them. 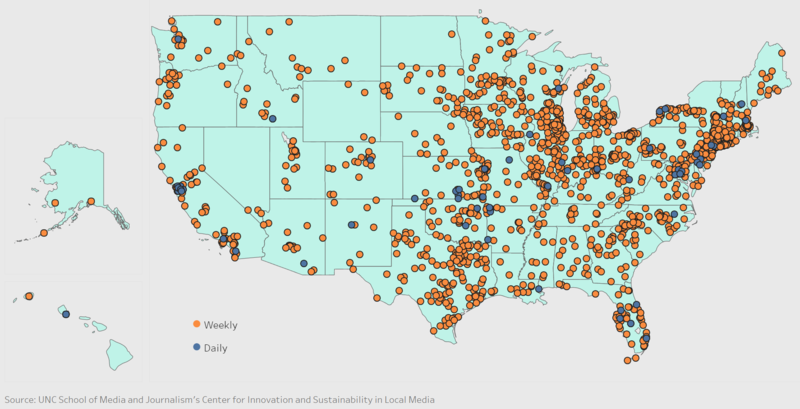 There are almost 200 of the 3,143 counties in the United States without any paper – weekly or daily – creating a news vacuum for about 3.2 million residents and public officials in those counties. An additional 1,449 counties, ranging in size from several hundred residents to more than a million, have only one newspaper, usually a weekly that may struggle to find the resources to cover dozens of other communities in that county, spread out over many miles. In the U.S., 171 counties do not have a local newspaper. Nearly half of all counties - 1,449 - have only one newspaper, usually a weekly. In many communities, newspapers are often the prime source of local news and information. The South had the most counties without newspapers: 91. 17 Almost every state in the South had at least one news desert. In Georgia, 28 out of 169 counties did not have a newspaper and in Texas 22 out of 254 counties lacked a paper. Kentucky, Virginia, North Carolina, Tennessee, Florida and Oklahoma all had half a dozen or so counties without newspapers. Counties that recently lost their last surviving newspaper ranged from Jerome County, Idaho, with 22,000 residents, which lost its weekly paper in 2008, to Mayes County in Oklahoma, with 40,000 residents, which lost its once proud daily in 2017. Both counties have poverty rates significantly above the national average. The 1,449 counties with only one newspaper still publishing range from Arthur County, Nebraska, with 500 residents, to Montgomery County, Maryland, with more than a million people. Half of the newspapers that closed or merged were in large metro areas with more than 1 million people — such as Chicago, Washington, D.C., New York and Boston — and another 20 percent were in small and mid-sized metro areas such as Toledo, Ohio, and North Adams, Massachusetts. Of these 1,300 shuttered papers in metro areas, 1,250 were weeklies, most with a circulation under 10,000. Their demise leaves a news vacuum for America’s suburbs and urban neighborhoods, where residents have historically relied on community weeklies to keep them informed about the most pressing issues – from test scores in local schools to proposed tax hikes. Both affluent and low-income suburban and metro areas were affected. A number of factors drove the loss of the suburban papers. In many cases, as circulation declined and advertisers moved dollars from newspapers to broadcast and digital outlets, independent and family-run enterprises made the decision to cut their losses. In other cases, the corporate owner made either a strategic or financial decision to shutter the weeklies and invest elsewhere. The tiny Baldwin City Signal in the college town of Baldwin City, Kansas, outside Kansas City, and the much larger Suffolk County Life, a chain of 35 papers on Long Island, New York, that reached several hundred thousand households, are examples of family-operated enterprises that did not survive. In contrast to the local considerations that determined the demise of the Baldwin City and Suffolk papers, the closures of weeklies in the Chicago, Boston and Washington, D.C., suburbs were driven by the financial and strategic decisions made by corporate owners. In 2009, the Chicago Sun-Times, faced with bankruptcy, shuttered more than a dozen of its weeklies, 23 with a combined circulation of more than 200,000, most in predominantly affluent suburbs. These papers ranged in circulation from 1,000 to 27,000, including the 2,000 circulation Wheeling Countryside, which covered the 124-year-old village of 40,000 residents, 30 miles from downtown Chicago. Wheeling has one of the more diverse populations in the prestigious northern suburbs of Chicago, with a third Hispanic and more than 15 percent Asian residents. 24 When announcing this closing, Larry Green, then publisher of the community weeklies, noted, “The death of any newspaper is a blow to our democracy and to your local economy. . . . But as much as it is a public service, the Wheeling Countryside is also a business. It must be profitable. In the current economy it is not.” 25 Subscribers soon received a letter telling them how to subscribe to the Chicago Sun-Times, a daily covering an area of 3 million people with little specific content on a community like Wheeling. More than 500 newspapers have been closed or merged in rural communities since 2004. The average circulation of the shuttered rural papers was roughly 4,000, highlighting the small size of communities they serve. In many of these communities, the local newspaper is the only reliable source of news and information. Because of the isolated nature of these communities, there is little to fill the void when the paper closes. A 2016 FCC Report found between 40 and 60 percent 28 of rural residents lacked affordable, high-speed access to wireless services that would enable streaming of videos, for example. The economic challenges facing rural newspapers differ from those of their metro counterparts. These papers are often in small markets that are unattractive to advertisers outside of communities where the papers are located. Many of the papers that closed were independently owned and were forced to close when owners faced declining profits or couldn’t find a buyer. The dramatic pullback in circulation and coverage of state and regional papers has dealt a double blow to residents of outlying rural counties, as well as close-in suburban areas. Many of these communities have also lost their weekly hometown paper and are left without any credible and comprehensive sources of either local or regional political, economic and environmental news that can affect the quality of everyday life today and in the future. In the latter half of the 20th century, when circulation and newsroom staffing were at their highest levels ever, major metro and state papers routinely received Pulitzer Prizes, the most coveted award in journalism, for their aggressive investigative reporting. The Philadelphia Inquirer, Los Angeles Times and Boston Globe, for example, had a cadre of reporters, stationed in Washington and abroad, who often scooped The New York Times and Washington Post on foreign and national news. But it was at the state and regional level where these large papers had their biggest impact on the quality of life for residents in the communities where they circulated. In North Carolina, for example, The News & Observer of Raleigh received the Pulitzer Public Service Award in 1996 for exposing the long-term environmental consequences of large-scale industrial hog farming on the state’s rural counties, 35 many of which were struggling economically. By devoting a team of investigative reporters to the task of sifting through government records, analyzing data and then translating what they had found into lucid prose and compelling articles that consumed tons of newsprint, these large papers were able to set the agenda for debate of important policy issues that ultimately affected all residents in the state and region. On a day-to-day basis, the nation’s large regional papers also had scores of reporters assigned to bureaus in the suburbs and outlying counties, who were responsible for staying on top of news at the grassroots level by covering the often mundane and routine government meetings that rarely made headlines outside the communities they were covering. While editors at these papers believed they had a journalistic duty to cover regional issues, there was, no business model to support their expansive coverage. The vast majority of their financial support came from advertisers in their home city who had little desire or reason to reach consumers in these remote communities. Therefore, publishers began to take a hard look at the return on the investment from circulating print copies outside their metro area. Over the past two decades, this has led to dramatic cutbacks in both the circulation and staffing of the state and regional papers, the majority of them owned by the large newspaper chains, such as Gannett, McClatchy, Lee Enterprises and GateHouse. Since 2004, circulation for the large dailies has decreased by more than 40 percent and newsroom staffing by a similar amount. 36 A majority of the decline in daily circulation has resulted from the pullback of the large metros from rural areas. Recent research has shown that when metro papers pull back circulation and coverage in outlying areas, participation and voting, especially in midterm state and local elections, goes down.37 Additionally, there is evidence that the journalistic competition between metro papers and smaller community publications may spur more aggressive coverage of issues in these outlying communities since local reporters don’t want to be scooped by the big-city journalists. This is especially true when metro papers assign reporters to cover routine governmental meetings in outlying areas. The Wichita Eagle, the largest paper in Kansas, is representative of this decline in circulation, staffing and, ultimately, impact on the communities these papers covered. In the 1990s, The Eagle, then part of the Knight Ridder newspaper chain, gained national recognition for pioneering a new type of local reporting, called “civic journalism,” which sought to engage readers in determining coverage of important issues in a community. Editors surveyed residents to get their input and then aggressively covered those issues – ranging from environmental concerns to tax increases – holding public officials accountable for resolving them. In the mid-1990s, the Eagle had a circulation of 122,000 and more than 100 journalists in its newsroom (including both a dedicated Washington reporter and a team of state and regional reporters). It was distributed in 73 of the state’s 105 counties.38 Today, the paper, which is now part of the McClatchy newspaper chain, has a print circulation of 30,000 and a newsroom of fewer than three dozen journalists. It circulates in only 10 counties).39 The prominent three-story building in downtown Wichita that The Eagle once occupied has been sold to Cargill, and the newspaper has moved into a much smaller second-floor space in the restaurant and nightclub district. The Wichita paper is printed by The Kansas City Star, also a McClatchy paper, 200 miles away. Early printing deadlines make it difficult to offer timely coverage of both night sporting events and government meetings, and therefore lessens the relevance to readers and impact of the paper on the communities where it still circulates. The Wichita Eagle circulates in just 10 counties in Kansas, compared to more than 70 counties in 1992. The death of the two-newspaper town is yesterday’s news. Nevertheless, as recently as a decade ago, there were still a dozen or so large cities with competing daily publications. However, the recession of 2008, coupled with the simultaneous shift in readership away from print newspapers to online news sources, has led to the demise of half of the remaining stalwarts. Only four of the 62 dailies lost since 2004 had circulations of more than 100,000. All four were in two-newspaper towns – Denver, Seattle, Honolulu and the Tampa/St Petersburg region.